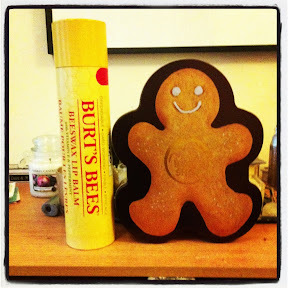 We’re having some scheduling difficulties at Get Lippie this week, so, in time-honoured “Test Card” fashion, here’s a completely irrelevant photo of a tin gingerbread man next to a giant lip balm to tide you over until normal service can be resumed. Hey you can never have too many pictures of cute men, in my opinion. Hope you get things sorted soon! Hahahaa! This really ticked me. Great picture.